Fairweather original drop handle collaborated with legendary handlebar maker Nitto. This road drop handlebar offers a traditional shape with a 75mm reach and a 125mm drop to allow for greater comfort anywhere on the handle. Great for road bike, cyclocross, and even MTB. Width: 420mm *Other sizes available on order. 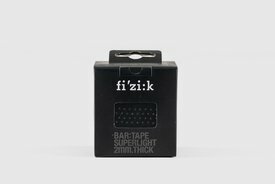 Fi’zik Superlight Classic is a 2mm thick bar tape, perfect for extra grip and better control. Made out of microtex, it is durable, strong, and comfortable to touch in any weather condition. Available in 4 touches : Classic, Soft Touch, Glossy and Tacky.